Stacksocial is giving away eight applications for free as part of a new years promotion. They claim these apps will help you become more productive in 2013 and who can argue with a price tag of $0? This free bundle of apps includes utilities like a video converter and screen capture software. While you most likely won’t install all of these apps, you can at least find a few that will suit your needs. IconBox 2 is a simple photo editing app that allows you to organize and manage all of your icons. You can make custom icons for your applications. This is a hand little program that will all you to take and manage all of your screenshots, like Snagit. You can edit your screenshots with annotations, arrows, text, and more. VidConvert is a simple video conversion application that will quickly transcode a video for you to use on your iOS device, Mac, and more. Handbrake is a great alternative video converter but has a higher learning curve than VidConvert. This is a simple image editor for those who don’t need all the power of Photoshop. Scale, colorize, convert, and flatten images with Image Smith. This provides the simplicity of Apple’s Preview app but with a few more features. Wallpaper Wizard gives you unlimited access to thousands of wallpapers. You can easily browse for and switch your wallpapers. They’re high resolution and can fit any screen. Check out our review of the Lite version of Wallpaper Wizard. ClipBuddy is a clipboard manager for the Mac. You can see a history of what you’ve copied to the clipboard. Never copy something over again! This is an application that will help you learn to type faster. There are thousands of different exercises for you to practice your typing. Type Fu probably isn’t going to be as fun as something like Mavis Beacon but it’ll do. Last but not least, we have Sweeite. This app will help turn your photos into text art. If you’re familiar with ASCII (the American Standard Code for Information Interchange), Sweetie basically turns your pictures into a bunch of text arranged in a way to look like an object. 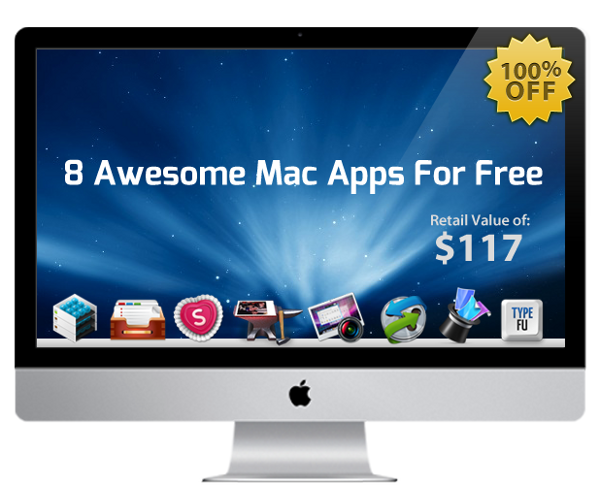 You can find The Mac Freebie Bundle here.